2019 will mark the last year of this great fly in. 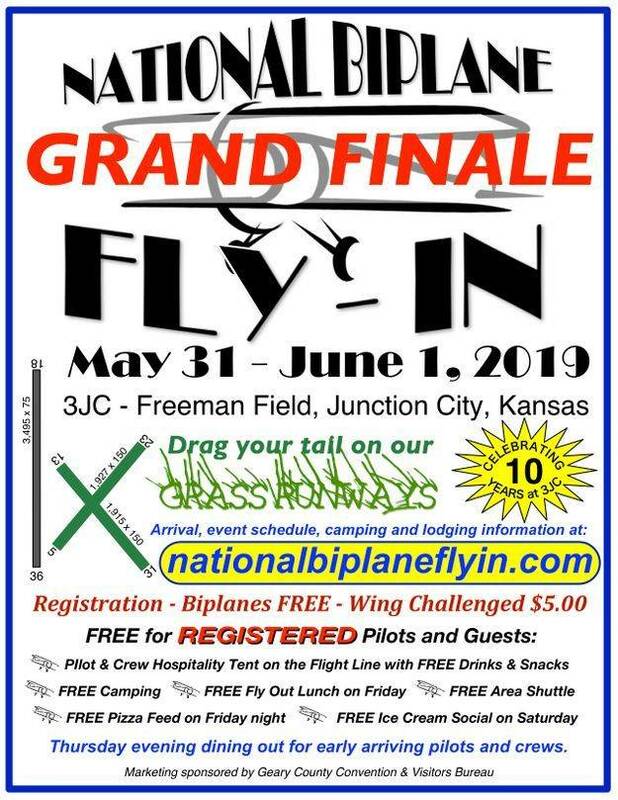 Make your plans now to attend the Grand Finale of the National Biplane Fly In. Early Arrivals - Pilot Shuttle available to and from area motels. 6:00 pm - Everyone welcome to join together for dinner at the La Fiesta, 503 E Chestnut St, Junction City, KS 66441. Arrivals all day - Pilot Shuttle available to and from area motels. NOON to 3 pm, Fly Out Big Meal, hay rack ride and Trap Shooting at Jim and Debby Clark's Prairie Cottage airport, 8KS8, 11 nm SW of 3JC, course 223˚. 6:00 pm - Pilots Pizza Feed and evening flying on the beautiful grass runways of Freeman Field. Public day with Aircraft arrivals and flying all day. Pilot Shuttle available to and from area motels. 8:00 am - 4:30 pm, Registered Pilots & Crew Hospitality Tent open on the Flight Line with free drinks for Registered Pilots and Guests. 9:00 am - 1:00 pm, Aircraft judging, please register your aircraft. Vendors will be serving lunch and treats on the ramp. 2:00 pm - 4:00 pm, Ice Cream Social for Pilots and Crew at the Pilot Hospitality Tent. 3:30 pm - Aircraft & Pilot awards at the Pilot Hospitality Tent. 6:30 pm - Fly In wrap party tray sandwiches at exhibit Hangar. 6:30 - 9:00 am - Continental Breakfast available in the terminal building for departing pilots and guests. The weather was FANTASTIC at the National Biplane Fly In! Pilots flew to Kansas from as far as Washington State and Florida to attend.